For Keir Johnston, the line between art and civic engagement isn’t just blurred — it’s often never there to begin with. 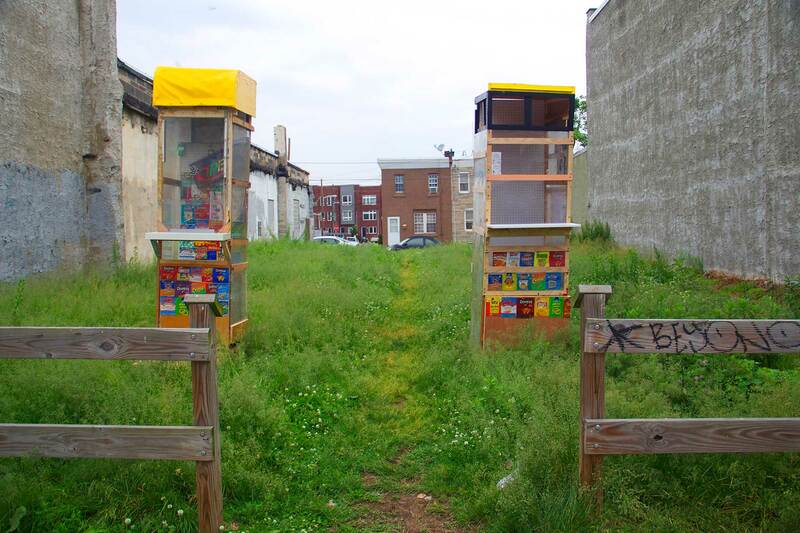 As a founding member of Amber Art and Design, a Philadelphia collective devoted to art as social practice, Johnston collaborates with communities of color to tell stories that have been overlooked by mainstream media. Freed from the confines of gallery walls, their art frequently resembles a neighborhood block party or parade. 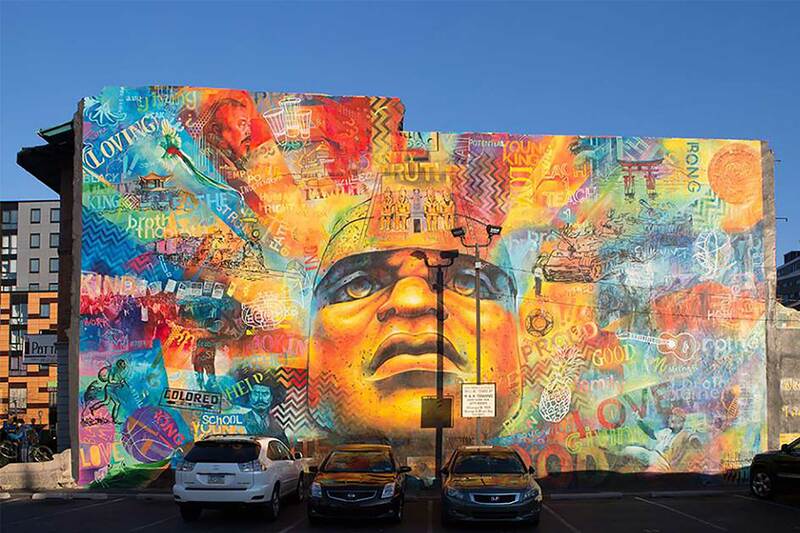 The group’s work includes the recent mural, “Building Brotherhood: Engaging Males of Color,” which reflects town hall discussions with men of color regarding the societal barriers that they’ve faced. 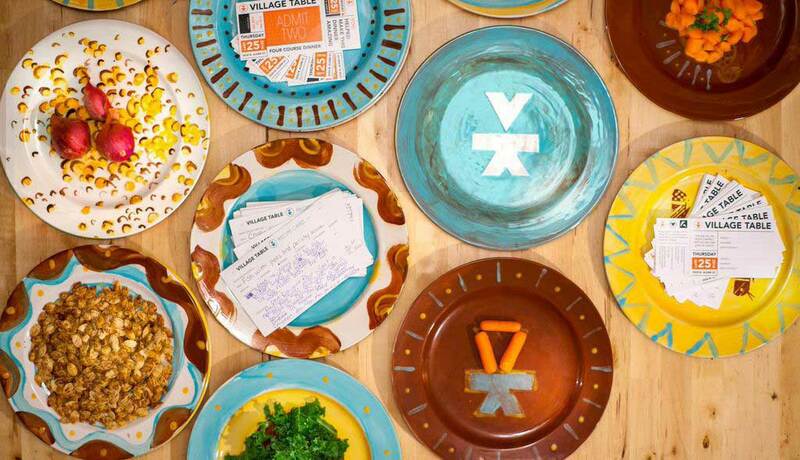 For “The Village Table,” the collective gathered more than 100 family recipes from North Philly residents and then hosted a four-course community dinner to celebrate their rich culinary history. 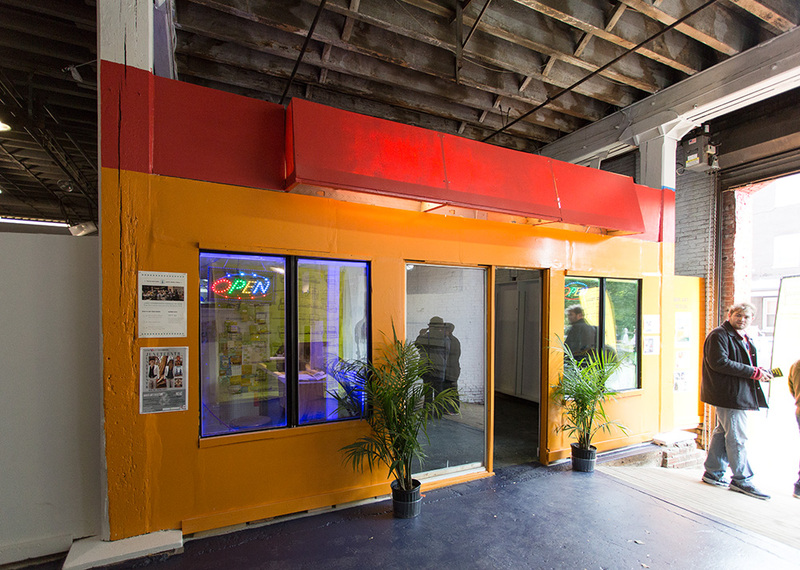 In “Corner Store: Take Out Stories,” Johnston and fellow artist Ernel Martinez wheeled two makeshift corner stores on a four-and-a-half-mile journey, sparking conversations about cross-racial tensions between African-Americans and Asian-American store owners along the way. Johnston spoke with us about how Philadelphia has shaped the artist that he is today, and his artistic mandate to seek out overlooked narratives. What do you do for a living and what mediums do you work within? I am an artist, educator, advocate, and social activist with a multimedia approach that includes performance, communal events, and innovative uses of space. In terms of my creative direction and medium, I try not to limit myself. I am constantly developing new forms of expression and approaches to creative projects. 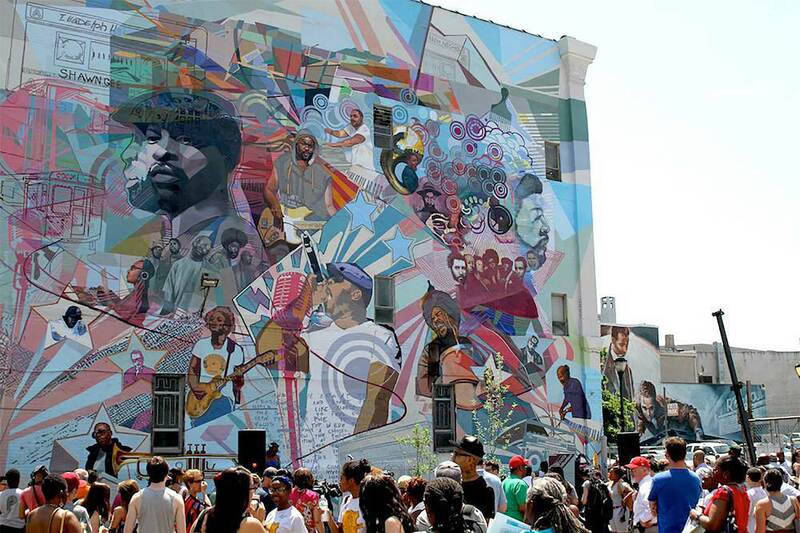 Photo credit: “Colorful Legacy” 2015 by Keir Johnston and Willis “Nomo” Humphrey. Painted plates for the Village Table. Amber Art & Design’s mission is to create dynamic and positive interactions between people and communities. Can you tell us why you founded this group? We founded AA&D out of creative necessity and an entrepreneurial response to our professional environment. We wanted our team to work together like a successful band, each person adding their own rhythms, timing, and unique contributions to a unified whole. There were also two functional seeds to our creation: We had a financial need to share studio space and we wanted to join forces as friends instead of competitors for an important large-scale commission. We were frustrated with being misrepresented by organizations we had collaborated with, not being properly credited for our work, and not having support for some of our more forward-thinking ideas around community collaboration. To avoid those problems in the future, we decided to create our own business based on an innovative collective model, where we could be self-represented and leverage the power of a group. This collaborative approach allowed us to experiment more and complete elaborate concepts without having to receive institutional or financial support. “Cleaning the Mansion” 2012 by Keir Johnston and Ernel Martinez. What are the major themes that guide or show up in your work? Amber Art & Design is rooted in social collaboration. We work mostly with communities of color, those with limited access to the arts and media outlets, and areas that are isolated from the affluent districts downtown. Many of these communities share a slew of positive and negative issues that simultaneously strengthen their unity and also limit their progress and growth. We aim to broadcast and amplify the natural beauty that exists in these overlooked and forgotten neighborhoods and subcultures. To do this, we take inspiration from the neighborhood (à la our Chinese take-out project and “La Frontera,” which focused on relationships between African-Americans and Latino bodega owners) and create projects that are relevant, sincere, and not esoteric. We often address issues around labor and immigration, isolation and limited access to education, employment and food, crime and pollution, communities divided among themselves, institutions that are out of touch with diverse communities, defacing aspects of humanity, and hidden and neglected narratives and histories. You began with murals, what inspired your move into more interactive, performance-based work? Just doing murals was limiting the things I wanted to say and how I wanted to say them. I realized that it was up to me to look for alternatives. Through collaboration, I discovered other mediums and ways of expression that felt more urgent to me and directed how I had to spend my creative time. We aim to broadcast and amplify the natural beauty that exists in these overlooked and forgotten neighborhoods and subcultures. Your interest in often overlooked or misunderstood community members immediately got our attention. How does the Philly community influence your work? It is our creative duty and initiative to seek out the best stories. In the neighborhoods where we work, there are many moments of hidden inspiration just waiting to be seen. Each person has their own unique history, which is then part of the greater story of the house, block, street, neighborhood, and ultimately the city. The waiting room in the Chinese take-out store, boxed by four walls of one-inch thick plastic becomes a stage for local theater as well as a narcotics market. The bodega becomes the verbal testing ground for a black youth to practice his first lines of Spanish with his cherished “papi” store owner. It’s a very different reality than the plastic and speed of downtown. If you are brave and comfortable enough to be in these places, these moments can fuel a lifetime of work if you slow down to appreciate them and have an honest interaction. 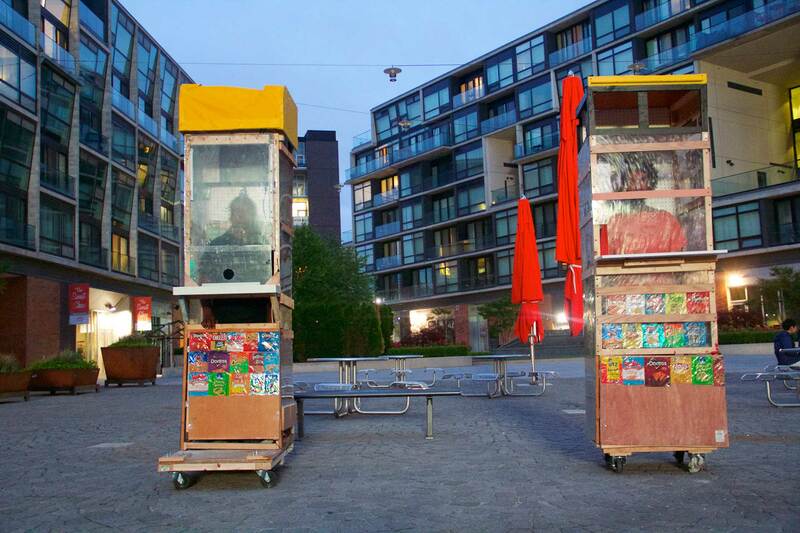 “Corner Store – Take Out Stories” 2014 Installation and performance by Keir Johnston and Ernel Martinez. How does the community react to your work? Has their relationship with it evolved over time? We often work in hard-working neighborhoods with normal everyday people who aren’t used to getting invited to galas or exhibitions. These communities regularly collaborate with us, so I would say that we’ve evolved together, especially in areas where we’ve worked repeatedly. Time helps coalitions form. Eventually, we’re no longer seen as strangers and trust grows. Most of our inspirations come from varying aspects of the community and we express these in a variety of ways. For example, spontaneous urban performances evoke a bit of a confrontation and a sense of wonder. During these performances, people frequently ask us what exactly we are doing. Mural making is a bit like interactive stage painting. Exhibitions are our newest point of interest. They provide possibly the biggest and freest challenge, because we’re often given total freedom to fill the space with whatever we want to show. Programming in institutions is another great option for creative collaborations and community interaction. Public speaking allows us to go into a bit more in depth on our influences and theories behind our work and share in a more intimate way with the audience. 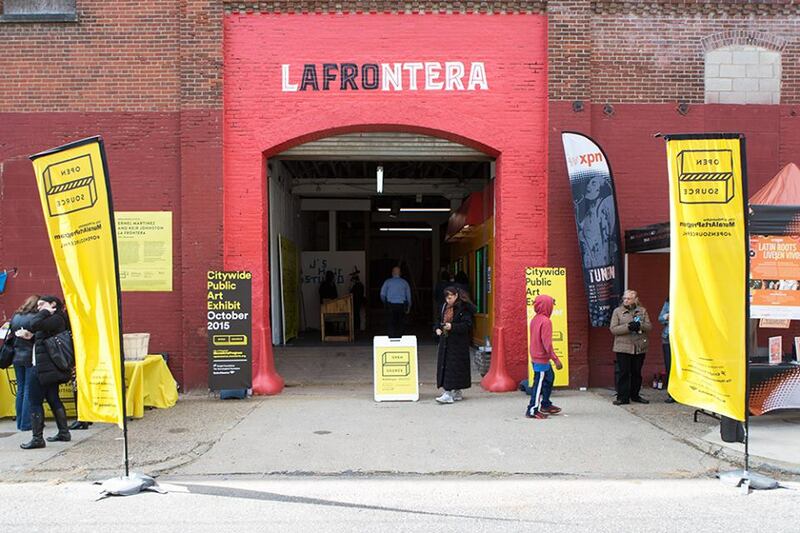 “La Frontera” 2015 by Keir Johnston and Ernel Martinez. That’s similar to asking about my favorite color or cuisine — every piece has meaning. 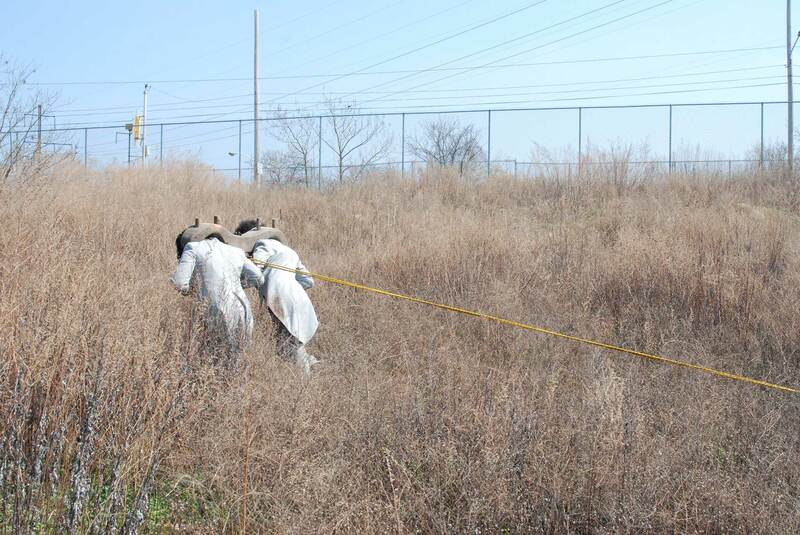 One of our earlier collaborations, and an important moment of transition for us as a collective, was when we had a residency in Tulsa, Oklahoma. We worked directly with the Greenwood neighborhood on a project that addressed the 1921 race massacre. This was the first time we traveled out of state for a residency and we really grew from the experience. The project involved a lot of heavy issues and social scarring. We were able to intensely study the relevance of our work and how we attempt to spawn healing and needed conversation around such potent subjects. Ultimately, we were able to have a successful show and relate some of the incidents of civic brutality in Tulsa to the MOVE bombing here in Philadelphia on its 30th anniversary. 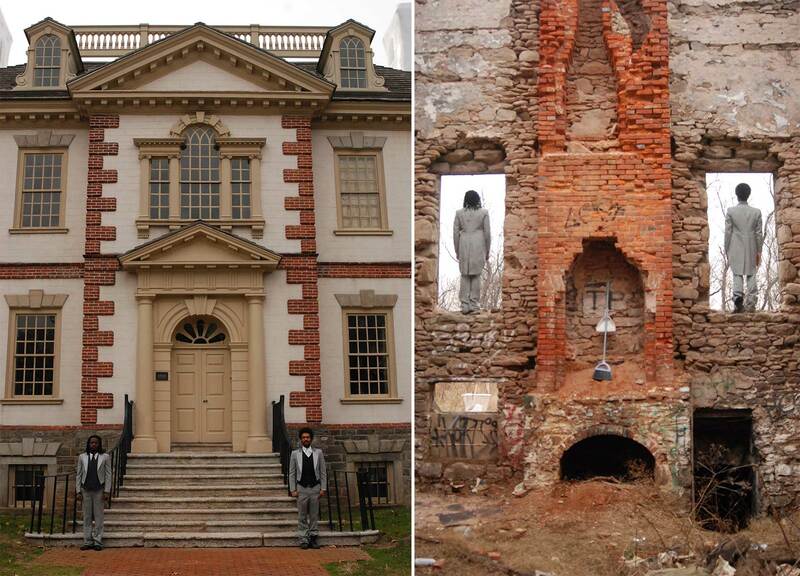 We created a subsequent dual exhibition here in Philly. 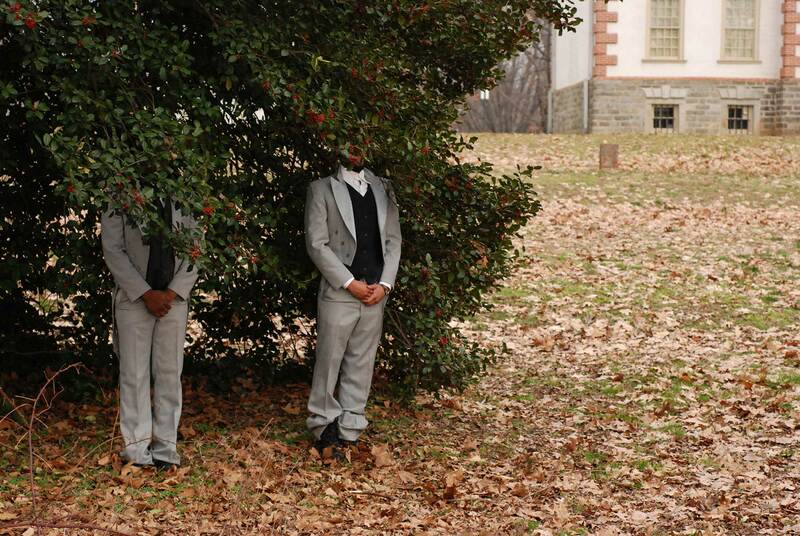 The performance included a procession of healing that started at the site of the bombing and ended up at the Philadelphia Museum of Art, where MOVE member Pamela Africa was in attendance. This was a very powerful series of events for us. Do you remind repeating the anecdote you told at the Philly Creative Space event about the importance of meaning in your work? I was on a panel discussion with a Temple University professor who told a story about street art that she used to pass on her way to work. The piece said, “First we had the land and they had the church. Now, they have the land and we have the church.” She looked forward to seeing it every day, and it always encouraged her to reflect. One day, the quote was replaced with a bright painting of flowers, similar to others she had seen around town. The new mural lacked the intelligence that the previous piece held for her. It never sparked any thoughts or made her feel anything like the old one had. 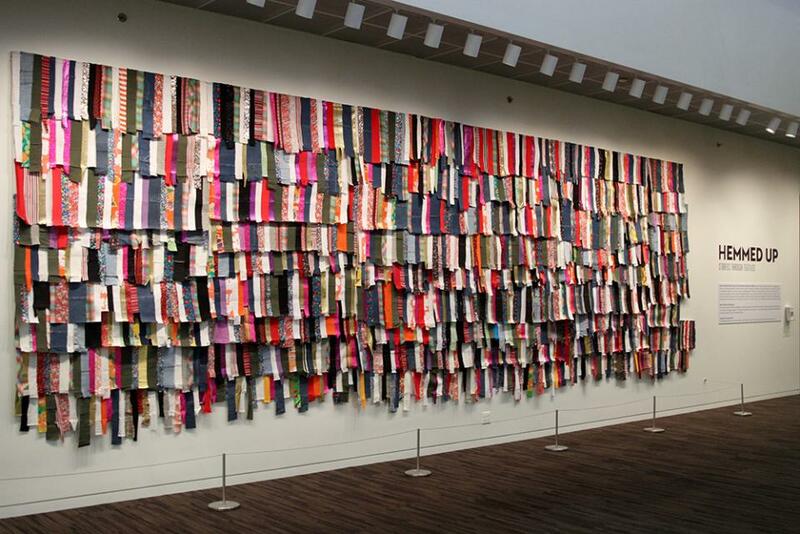 “Hemmed Up” Keir Johnston and Ernel Martinez, 2013, inaugural artists in residence for the National Museum of American Jewish History. How does your personal history influence your work and make it unique? Everything is cumulative. I could not remove any moment from my personal history and still be the person I am today. My parents really instilled the importance of learning in me. Not the collegiate approach, but one of self-growth and personal knowledge. Not taking an individualistic and capitalistic approach to art making, but instead taking a group and a collaborative approach, while still having the freedom to pursue my own endeavors, has made me a better human being and a much better artist. This is a place that I could not have reached otherwise and it’s a constant work in progress. I think things that separate myself and my collective are our aesthetics, the community approach that we apply to projects, the subjects that we address, the environments that we immerse ourselves in, and the level of social interactions we are privileged to based on our backgrounds. Also, most people wouldn’t take on the risk and endurance that much of our work requires. Each person has their own unique history, which is then part of the greater story of the house, block, street, neighborhood, and ultimately the city. What sorts of risks are involved in the art that you do? Whether through performance, space making, or mural painting, we’re constantly making ourselves accessible and vulnerable while making our work. The themes and political threads that we embrace involve risk as well. In a society that can barely hold a real conversation about race and the roots of social disparities, we put these subjects at the center of our work. Then there’s the sheer physicality of completely committing oneself to the moment. During performances, I have stood up to my neck in rivers, lain face down in glass and bags of trash, entered crack houses and dilapidated structures, and spent time with drug dealers and prostitutes. Philly’s park systems are fantastic. The waterfront areas have really evolved and parks like Fairmount Park, Wissahickon Valley Park, John Heinz National Wildlife Refuge, and Bartram’s Garden are urban gems. The Reading Terminal Market, an indoor farmer’s market, is still one of my favorite places to be. “Legendary” 2013 Amber Art and Design. A local tribute to The Roots. Cover image drawing: Phillip Adams – 2011.